The high price of sugar in the United States is hurting local food manufacturers, including an Akron based company. 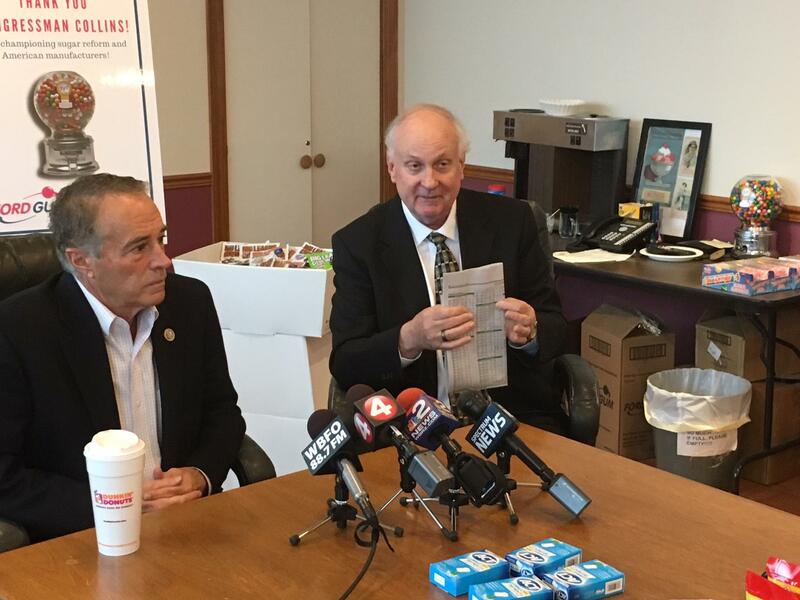 Congressman Chris Collins listens as Ford Gum President George Stege calls for sugar reform. So Congressman Chris Collins is pushing to end a Depression-era subsidy that forces U.S. food manufactures to pay twice as much for sugar as their global competitors. Ford Gum President, George Stege says, compared to five years ago, Ford's gum ball production is down 30-percent. And he says that can't continue. "So what we would like to do is, we'd like to modify the Farm Bill, and basically modify the sugar program with sugar reform, so that we can compete, not with an advantage, but at least on an even keel, with our competitors, and able to get sugar at world prices, or at least close to world prices," Stege said. The farm bill only comes up every five years, that's why, Stege says, it's critical to get sugar reform passed in 2018. Ford Gum has been making gum balls for more than 100 years. It's products are sold worldwide. The Akron based company employs about 150 people.